Women’s brains are like spaghetti. 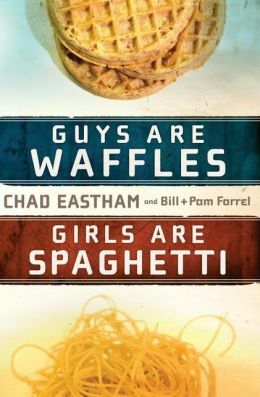 Their thoughts are sometimes hard to follow, like a single noodle in a bowl full of tangled spaghetti, whereas men’s thoughts are compartmentalized, like syrup-holding squares in waffles. Spaghetti brains and waffle brains. My husband had this look on his face like, Nailed it, as if he had been searching for exactly the right way to describe my scrambled, tangled, easy-to-get-lost-in way of thinking for quite some time. But now he had something to compare my mind to – spaghetti. And he was about to say “I do” to an eternity of bowls and bowls of it. Now, nearly 4 years later, I’m still immensely amused by the number of times in a week alone that Will gets raveled up in my thought process. It’s become a favorite hobby of mine – to see how fast I can lose him starting from one end of the “noodle” to the other. But then I started thinking maybe I should protect him a little bit more and warn him about what he’s getting himself into instead of dumping my metaphoric bowl of spaghetti on his head. Because let’s face it, ladies: we’re pretty scary creatures, and I think our awesome minds may be a little too scary for our men sometimes. Cool gift, though. Close to 3 years of marriage, and Will still has the insatiable desire to ask me what I’m thinking. He just has to know, which I appreciate, and am usually happy to accommodate him with an answer (unless I’m thinking about something embarrassing, like the mafia breaking into our apartment and stealing our cat). But unless it’s actually something serious, he usually immediately regrets his decision when I say, “Well. It all started when…” Lost him again. Will may regret asking me what I was thinking about, but he never interrupts me. He waits it out, no matter how agonizing it is for him to follow my thoughts as they jump from lilypad to lilypad. His face looks a little pained though… Maybe I should start summarizing. I can understand that, because I live with myself every day, and sometimes even I make my own head hurt. It’s a crazy wilderness up there and anyone is subject to get lost. Even you. Will does really want to know what I’m thinking, but I think I give off a distinct glimmer in my eye or something when whatever I’m thinking about is in no way urgent and not necessarily remotely important, because when he sees said glimmer, he quickly retracts his statement. He knows he’s about to enter my “Mind Battlefield” (oooh what about that? Good name or keep searching?) and he’s not armored for such a task. Holly: Will, I’ve been thinking. I pretend to be really offended by this response, but really I just know he doesn’t want to go through steps 1-4 again. I think a lot; in fact, I don’t think I ever stop thinking. Sometimes I keep myself awake for hours because I can’t turn my brain off. But men? Men are perfectly capable of not thinking. When you ask them what they’re thinking about, and they respond with “nothing”, they’re being for real. They’re thinking about absolutely nothing. I would love to know what that’s like, just one time. Actually I think I experienced it in a yoga class once, but then someone walked in with freshly baked muffins and my meditation was all thrown off. Our poor guys. Think our spaghetti minds should go a little easier on ‘em? Deeply, wonderfully, tastily true. And who knew that waffles paired so well with spaghetti?